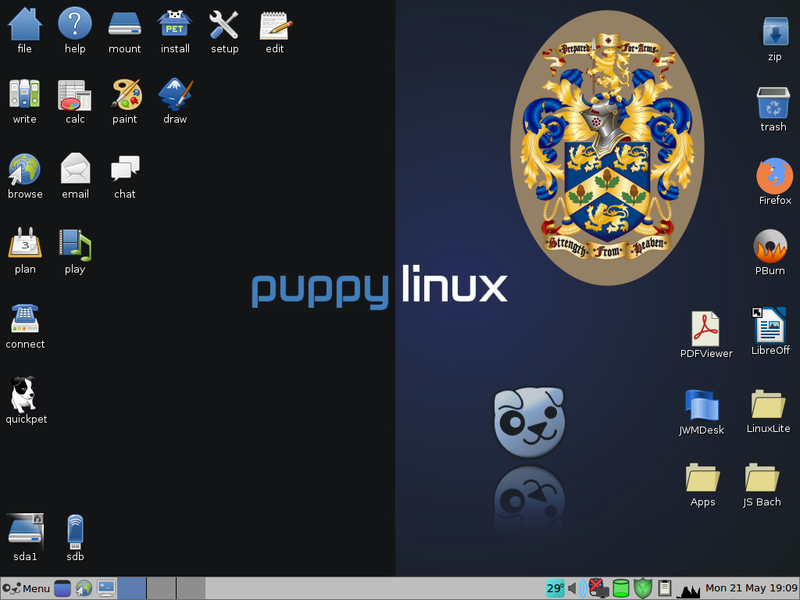 Puppy Linux Discussion Forum :: View topic - Is there an Internet browser for Linux? Is there an Internet browser for Linux? Posted: Thu 24 May 2018, 06:32 Post subject: Is there an Internet browser for Linux? I wonder if there might be a Linux browser??? It seems the only thing preventing me from using my [older] Linux Puppy is... [the] ...obsolete Internet browser enforcement for most likely than not, gathering information for advertisers. PS -- Oops, I didn't realize the graphic was going to be so huge. The graphic speaks to my PC having been upgraded to 64-bit. With 32-bit compatibility my Wine isn't performing but I hadn't planned on this post but for the image. While on the topic--any clues? Yes, the folder says "LinuxLite" and that's another load on the drive. It's the only one so far that runs my very old CorelDraw8 without a glitch. It helps if you tell us exactly which Puppy you want to upgrade the browser in. Sometimes missing libraries must be added for modern browsers to work in older Puppies, and that can be a monumental hassle. Better to upgrade to a newer Puppy that comes with a newer browser. I once released a Puppy Linux with 12 browsers. If your question relates to running a modern browser on an older puppy it's an almost insurmountable problem. However the latest Puppies will run the latest browsers with ease. It all has to do with which libc and which gtk version the puppy has a built-in.. older puppies ran older versions of both.. newer puppies run the most up-to-date versions.. Certainly the links browser is for linux! It can be used in CLi or GUI mode. Thank you. I have been working with my new XenialPup64 for several days and discovered Pale Moon. Seems to be what's needed. This may be difficult to believe and I've made bad correlations in the past, but it would seem Pale Moon offered me the one thing I could not get away from by using Firefox. You see, unless I'm paranoid and I'm prepared to accept that as a possibility, my XenialPup64 keep[s] shutting down whenever YouTube viewing. I'm a little vocal and dissatisfied with YT policies. I was just able to view using Pale Moon without being cut off. I wonder as I've answered negatively when the survey appears. At first thought it to be a memory write over with my Pup. Then I thought it could be some bad hardware but I shall go surf a little more then sign-in and surf once again. I'm hoping without an issue for shutting down my PC. My next effort is to get a compatible Wine. I've loaded the Dev and 32-bit compatibility along with trying numerous versions of Wine. Right now I'm running a freshly loaded XenialPup64. If I don't sign-in to YouTube my machine isn't shutting down. I think my posts are not wanted on YouTube. Ran my XenialPup64 for hours yesterday afternoon. Ran this morning but as soon as I went to YouTube my whole machine shut down. I don't think this is a Linux issue but one of YouTube behind the scenes action, but nevertheless, my PC is shut down again after going to YouTube. It has to sit for a short time and will restart. Working from a different machine. Will see if shuts down. Been surfing from a Windows7 machine for more than an hour with no trouble. This may be a PC issue but will update. That sounds like an over-heating problem. I think member rcrsn51 is onto something here. Care to share the specs of your YouTube-allergic PC? Also did you tell us which Puppy it is running? Sounds like a graphics hardware or processor overheat problem. Check the air inlet, outlet openings in the computer. Check that all cooling fans are working. There is the chance you got some malicious code. Check your browser for any add-ons or extensions you do not recognize and remove them. IIRC, XenialPup has a temperature monitor in its system tray. What is it reporting? These monitors can be misleading if they are not calibrated correctly.